Michigan is a great state to “get away from it all,” chock full of beautiful natural destinations. But if you’re just driving up for the forests and Great Lakes, you’re missing out on the excitement of its cities. Look at Grand Rapids and its downtown packed with restaurants, museums, events, and enough breweries to warrant the nickname “Beer City USA.” It’s the perfect city for a weekend trip, which is why we’ve rounded up the best things to eat, see, and do to get the most out of your Grand Rapids experience. Sure, the shoreline of Lake Michigan is just a short drive to the west, but you don’t need to leave this city to have a good time. Real Food Cafe might not have the flashy reputation of other “hot” brunch spots, but stop by once and you’ll end up coming back every morning. The Eastern Avenue cafe (they also have a location near Northview Heights) is about 4 miles south of downtown and has the feel of a truly heroic diner, with excellent service even on crowded mornings and a no-frills menu that gets everything right. 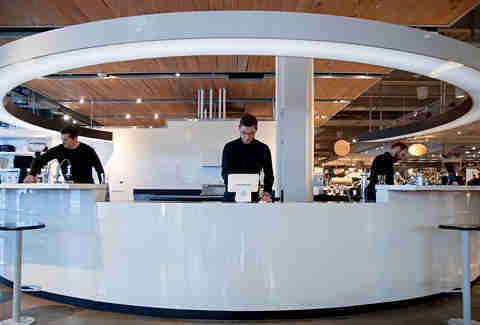 Customers rave about their huge portions and excellent baked goods at the counter (be sure to try the cinnamon rolls). Since the cafe keeps things truly old-school, be warned that they are cash-only, but the prices are low enough that it’s not too much of a hassle. Grand Rapids’ favorite coffee nerds opened their third location in 2017, and they’re more popular than ever. MadCap takes coffee really seriously, tasting thousands of bean varieties a year and selecting their favorites to serve at their cafes. (You can buy their “Roaster’s Choice” bags at the stores or even have them shipped to you.) The cafes include windows so you can watch the roasting process yourself, and baristas possess an encyclopedic knowledge of the endless caffeine options. While all the locations (Downtown, Midtown, and in Downtown Market) are a great choice for a pick-me-up, their Midtown shop on Fulton Street also serves fresh waffles topped with seasonal fruit spreads. 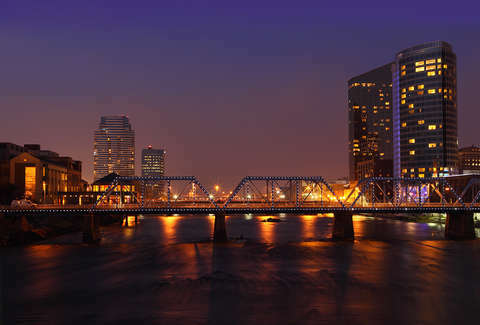 The river is what ties Grand Rapids together, so to truly appreciate the city, you need to explore it. There’s nowhere better for river sightseeing than Ah-Nab-Awen Park, whose name translates to “Resting Place” and was once a Native American village. Gently sloped hills and walkways over 6.5 acres make this the perfect place to relax and take in the view of the water and skyline, or enjoy one of the many events held here. The park hosts the end-of-summer CityFest, a family-oriented festival, and it’s also the best place in town to watch Fourth of July fireworks -- as long as you stake out a spot early. 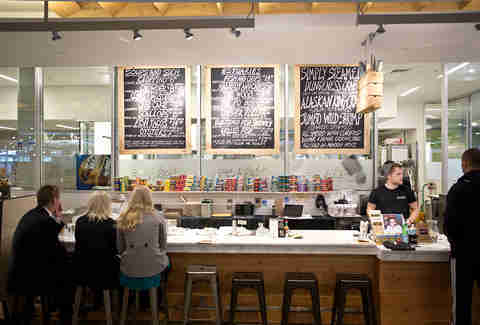 Foodies from all over are drawn to Downtown Market, Grand Rapids’ culinary center of gravity located just south of Heartside Park. With over 20 vendors, two full-service restaurants, and regular food-related events, there’s something to satisfy every craving. Be sure to check out their outpost of Detroit-based Slows Bar B Q, serving the same fan-favorite brisket, ribs, and pulled pork as the original. Or just enjoy the visual feast at Aperitivo, the hall’s wine, charcuterie, and cheese shop with breathtaking spreads. If you’re there at the right time, definitely sign up for a cooking class (most cost $75-$95). Learn how to make Vietnamese rolls or Spanish tapas and take a new skill home with you. If you’re the type of person who likes a bit of nature with your art, Frederik Meijer Gardens & Sculpture Park is the place to go. Located about six miles from downtown, the massive 158-acre campus combines a botanical garden and art into one experience that could take up to eight hours to explore entirely. An entry fee of $14.50 gets you into the gardens, where quiet walkways and trails connect the sculptures (featuring works by artists like Auguste Rodin and Ai Weiwei), while permanent horticultural exhibits ensure a variety of interesting flora. Must-see exhibits include the tropical conservatory in the greenhouse (which also houses tropical birds) and the carnivorous plant house (dedicated entirely to venus fly traps, pitcher plants, and the like). If you’ve followed the art world at all in the past few years, you’ve probably come across a picture of Anila Quayyum Agha’s Intersections, the shadow-based work inspired by Islamic art. This award-winning piece is just one of several current exhibits at downtown’s Grand Rapids Art Museum, which also displays an extensive (more than 5,000 works of art) permanent collection. There’s a schedule of free drop-in tours highlighting different aspects of the collection including abstract art, portraits, and furniture & design. But the best time to visit is during Grand Rapids’ massive ArtPrize competition, which takes place for 19 days each fall. 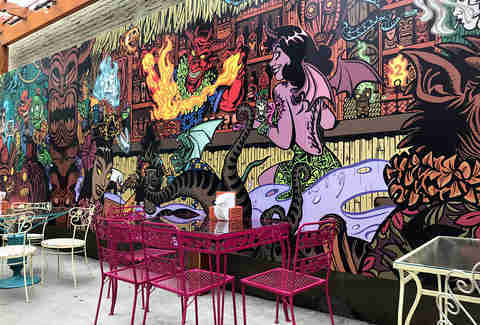 During this annual event (this year happening September 19 to October 7), works from hundreds of artists are showcased in venues across the city (bars, public parks, laundromats), and GRAM often displays some of the strongest submissions. “Beer City” is a pretty apt nickname for a place with more than 20 breweries (a number that rises to 60 when you count the surrounding towns), but where do you start? Keep calm and check out the Beer City Ale Trail, a map of the area that catalogues all the malty, hoppy options. While you’re certainly (hopefully) not going to be able to hit all of the breweries and brewpubs in one weekend, guided tours (like ones offered by Discovery Michigan) make it easy to see your favorites. 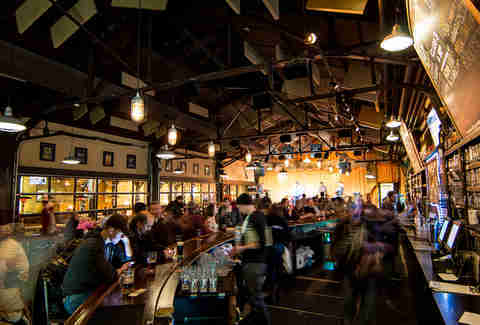 Founders Brewing Co. and HopCat are the two most well-known (and popular) destinations, and they’re conveniently within walking distance of each other downtown, making it simple enough to make your own brewery crawl. Start by sipping a Founders All Day IPA straight from the source, then 10 minutes later you can be sampling HopCat’s selection of 49 taps pouring beers from Michigan, around the US, and its own brews. (Don’t forget an order of Crack Fries on the side.) If you’re really going for the gold, though, pick up a Brewsader Passport (or download their app) and try to rack up as many stamps as you can. Located in the East Hills neighborhood, Grove is one of the most critically acclaimed restaurants in town (it’s Grand Rapids Magazine’s 2017 Restaurant of the Year), with a focus on farm-to-table dishes using ingredients drawn from the area’s many surrounding farms. While the menu changes daily, they always feature a variety of cold & hot appetizers, entrees, and plenty of vegetarian & vegan options. A customized tasting menu allows you to sample everything that catches your eye. Reviewers praise the beef tartare (served with pickled mushrooms) and the confit duck leg, but you could probably throw a dart at the menu and find something delicious. One of Grand Rapids’ great hidden gems is Stella’s Lounge, a bar that manages to combine upscale and retro into one unassuming location tucked away downtown. If you’re a true whiskey snob, look no further, as they have over 250 varieties available, including some Michigan-made options. While their website may joke that “the soup of the day is whiskey, no crackers,” they actually have some amazing food options, such as their giant cheese-stuffed burgers, named Best Burger in America by GQ in 2012. The kitchen stays open till 1am, so it’s a great option for after-drinks eats. While you’re relaxing with your whiskey after polishing off a massive burger, you can also play one of their many vintage arcade games, where plays still cost just 25 cents. SPEND YOUR NIGHT AT THE B.O.B. The name says it all: The B.O.B., short for Big Old Building, is a repurposed warehouse originally constructed in 1903 that is now a massive entertainment hub downtown, filled to the brim with things to do. Grab a wood fired pizza at Bobarino’s, listen to jazz at H.O.M.E., or catch a comedy show at Dr. Grins. On Friday and Saturday nights (note that it’s closed Sundays), you can expect to find all five floors packed to the rafters with people, so just embrace it: Hit the dance floor at nightclub Eve on the top floor, or get tickets to see whoever is playing the concert venue 20 Monroe Live. 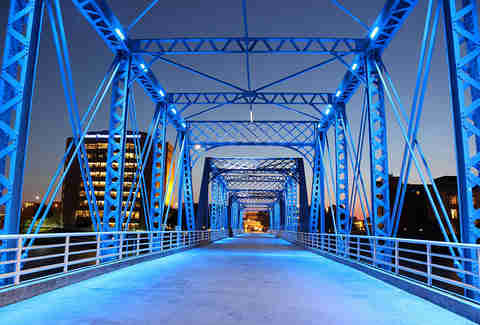 Grand Rapids has a few must-Instagram spots, and the Blue Bridge (especially at night) is one of them. This quiet pedestrian walkway connecting the Swan neighborhood to downtown is an iconic symbol of the city, originally built in 1892 as a railroad crossing over Grand River. In addition to its claim as one of the longest truss bridges in Michigan (575 feet), its central location makes it easy to see the city’s key landmarks by walking across. On the west side is the Grand Rapids Public Museum, a worthwhile stop for those interested in regional history and kids’ science exhibits. To the east is the aforementioned B.O.B., though also be sure to walk up and down the Riveredge Trail for an up-close look at the city’s namesake. If you’re looking to see the best of Grand Rapids’ music scene, The Intersection is the place to go. Hosting both national touring acts and local bands, it’s a great way to discover a new favorite group. The 1,500-person capacity main room hosts big-name musicians, album releases, and dance parties. (This summer’s lineup includes pop punk act Four Year Strong and cover band Mega ’80s.) But for the real indie fans, check out The Stache, their 225-person room known for launching local talent. (Years before they were Spotify-famous, bands like Moon Taxi and Twiddle were rocking The Stache.) So in just a few years, when that same band is selling out the main room, you’ll have “I saw them first” bragging rights.